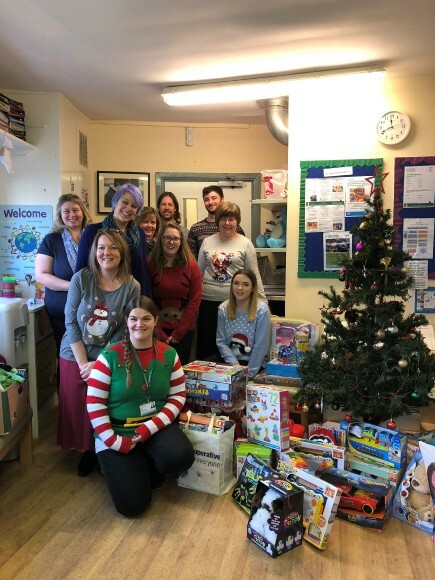 Colleagues based at Radstock Co-operative Society’s Head Office played Father Christmas last week when they generously purchased a wide selection of toys and gifts to donate to the Radstock Children’s Centre. Rather than participate in the traditional office Secret Santa gift exchange, the staff decided to continue the trend from the previous four years and donate toys to the Children’s Centre for distributing to families whose children would otherwise go without this Christmas. The Children’s Centre is based in Radstock and provides much needed support to disadvantaged children and families who are struggling whether it be emotionally, financially or in need of general support to cope with challenging behaviour, alcohol or drugs misuse, domestic abuse etc. It took a small army of colleagues to deliver the toys to the Centre done Santa style appropriately packed into black sacks! Colleagues from the Centre will ensure that vulnerable children who are affected by the family environment are able to receive a welcomed present to help make the festive period a little more enjoyable.